The Vogue Tile 1/2 in. x 12 in. 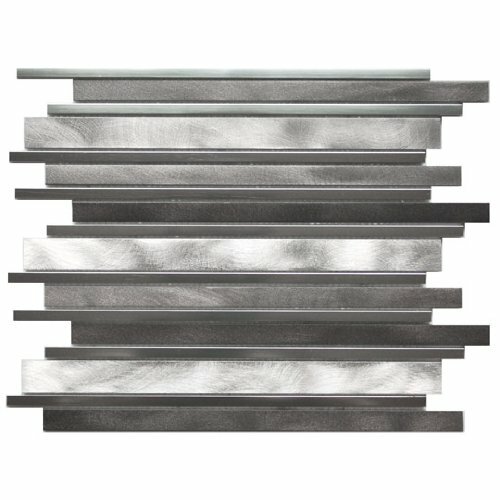 Courant Resin Pencil Trim Wall Tile is bound to spice up your living space. 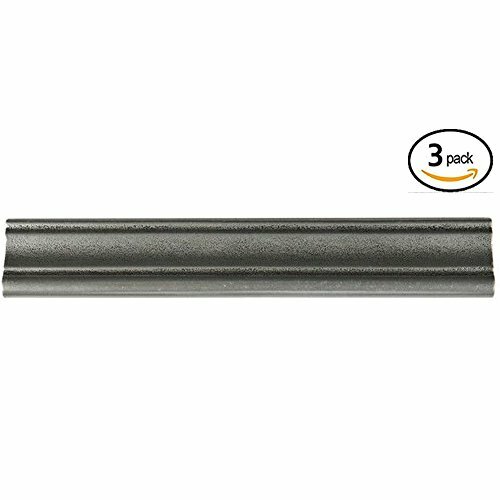 This mixed-material trim has a metallic finish with a textured look and noticeable definition. The light bronze line through the center of the rounded trim acts as a great divide between its surrounding installations. 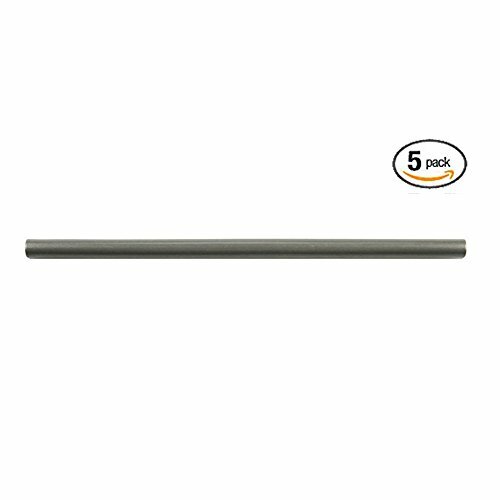 Use this smooth, medium sheen pencil trim as a finishing piece between two looks or pair with other products in the Courant series. -Number of Pieces Included: 5 -Indoor -P.E.I. Rating 0 is suitable for walls and residential use only -Wall tiles are not C.O.F. rated -Tile sells as an pack of 5 piece Each line item within an order will be selected from a single dye lot (color) and caliber (size), but multiple orders can result in receiving multiple dye lots and/or calibers. Please ensure that all tile for a project is obtained within one order. 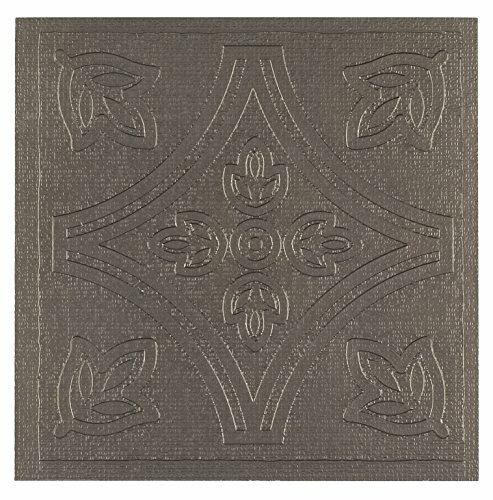 This pewter-colored, mixed material trim tile is great for splitting up other treatments or other tiles in the Courant series. Achieve elegance with these metallic-look Courant tiles. 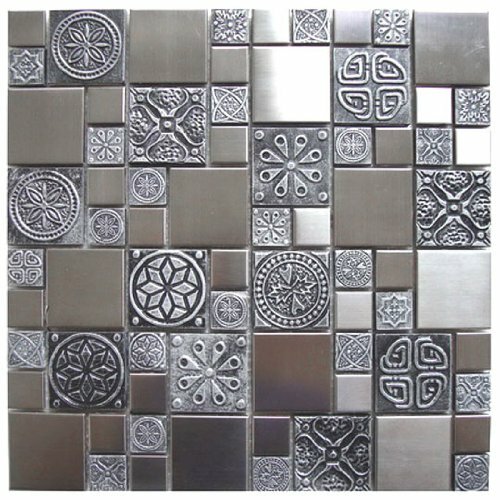 Inspired by the antique cobblestone streets of Europe this metal mosaic stainless steel tile features three different sizes of tile including a large square small square and medium brick but also features matte pewter resin accents that have a unique design and texture. 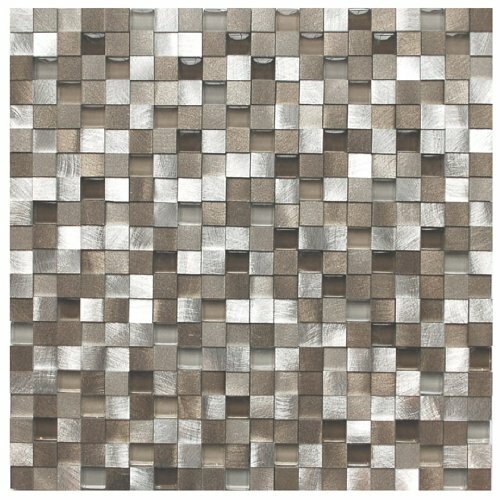 This tile is ideal for stainless steel kitchen backsplashes accent walls bathroom walls and bathroom back splashes. The tiles in this sheet are mounted on a nylon mesh which allows for an easy installation. 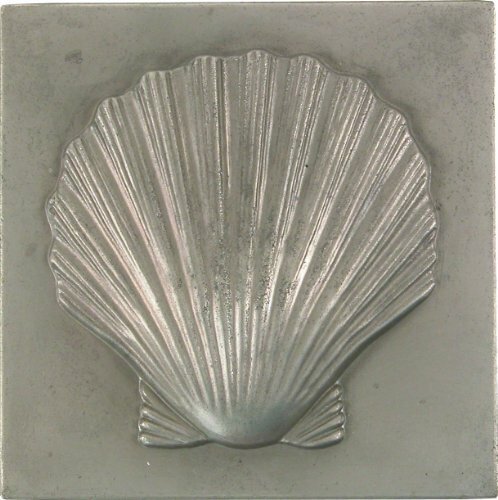 Shell Collection 4" x 4" accent tile with a durable pewter finish and a solid Forged Aluminum tile construction. This tile is solid Aluminum, not a coated or plated ceramic or plastic tile. The Brass Elegans accent tile is second to none in quality and will give your project a classy splash of color and an unmatched flair. This tile is easy to install in any unique pattern right along side of your standard ceramic or glass 4"X4" tiles. The decorative finishes can be used to match or accentuate your fixtures and hardware. This product is not recommended for pool or floor applications. The SomerTile 1 in. X 1 in. 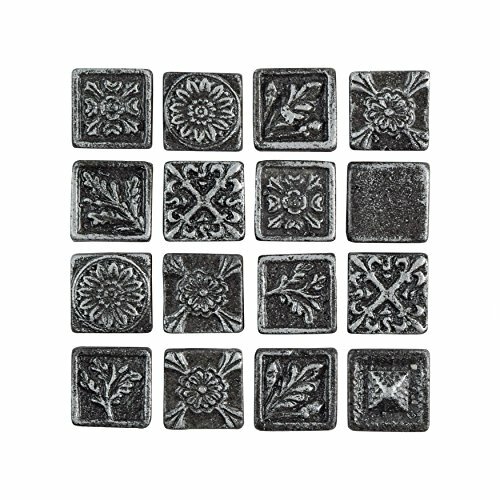 Trent square pewter metallic resin wall medallion tile offers a small, metallic finished product that appears as worn medallions. Feel free to use this tile with any other product to create a very Vintage look. It is recommended that you only use this tile indoors because it is only semi-vitreous, p.E.I. 0 rated and without a c.O.F. Rating.